I know John’s intentions are good. I know he’s genuinely trying to help to make the conference better. “Aargh, not again! Do you think no one has ever suggested this before? If I’d found a way during the twenty-five years I’ve spent designing and facilitating events to create better conference programs by asking people what they wanted in advance, don’t you think I would be using it? And so on. I feel sad and misunderstood and disconnected listening to John who doesn’t get the essence of what I’ve spent years creating and fine-tuning, to whom I’ve failed to convey something that I believe is valuable and important. I feel frustrated in much the same way as when I meet people who insist that the world is really less than ten thousand years old or are sure vaccines cause autism or believe there’s a scientific conspiracy to falsely declare that recent human activities cause climate-warming. 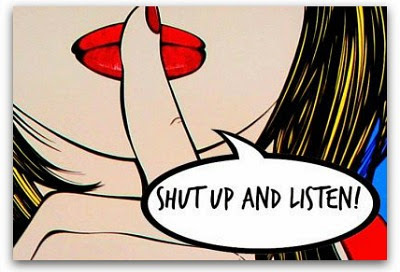 Regardless, I need to shut up and listen. Yes, it’s hard at moments like this for me to keep my mouth shut. But it’s important that I do. My job is to facilitate the process that’s going on, not offer my own opinions. And I feel better again. Which teaches me something else. Though I experience my feelings in the moment as permanent and unchangeable, my feelings are transitory. This too shall pass. If I shut up and listen. This entry was posted on Tuesday, December 26th, 2017 at 11:58 am	and is filed under facilitation. You can follow any responses to this entry through the RSS 2.0 feed.You can leave a response, or trackback from your own site.